In this article we’ll be discussing the best EQ pedals for bass in 2019. However, before talking about specific products, we’re going to briefly touch on what exactly a bass eq unit is, and how it works. 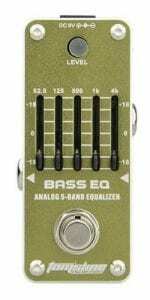 What is a Bass EQ Pedal? 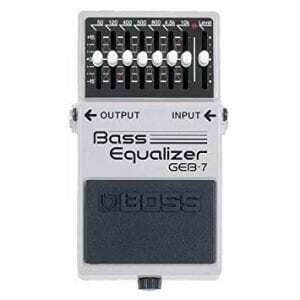 What Does a Bass Equalizer Pedal Do? 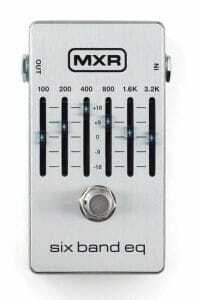 Bass EQ Pedals are processors that help adjust the amplitude (volume) of an bass audio signal at specific frequencies. These specific frequencies are determined by the user, and depending on the settings will help either amplify or suppress a frequency spectrum. Bass EQ pedals are more often used within a live performance environment, particularly useful for musicians who want to take control of their overall bass sound, who may not have access to the venue’s FOH system or have EQ functionality built-in to their amplifier. EQ pedals for bass guitar are generally not used within a recording studio, since equalisation will be taken care of by the studio desk and outbound rack-mountable EQ processors, which usually provide very high quality EQ. 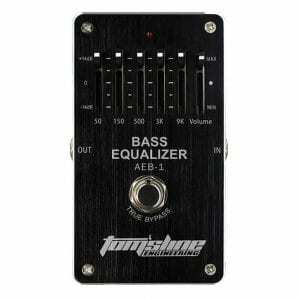 As we’ve previously discussed, a bass equalizer pedal will help accentuate or reduce the amplitude of specific frequencies that the user specifies on the interface. Bass EQ Processors will usually provide the user with the ability to make frequency adjustments from around 50hz/100hz on the low end to 10,000hz (10Khz). Although some might think that it’s only important to have access to low-end frequency adjustment, it’s also important to be able to reduce enharmonic frequencies that resonate above the core frequencies that are being played by the bass guitar, often causing harmonic distortion. Bass EQ Pedals are more commonly used alongside other bass effects pedals, such as a bass compressor pedal or a bass octave pedal. The question of where should an bass eq processor be placed within the signal path? arises, and we think it should be placed towards the end, helping control the overall post-effect frequency output. Now to talk about the specific pedals featured in this list… We’ve arranged them in price ascending order. 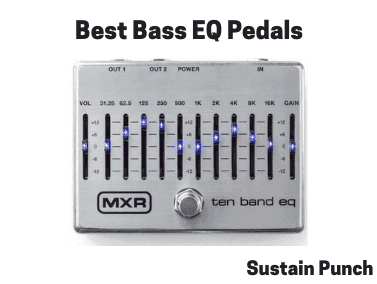 So without further ado, what are the best bass EQ pedals of 2019? For this price range, the Caline CP-24 is a bargain! The amazon reviews are great, although we’re not sure if this processor will stand the test of time like other pedals i.e Boss or MXR. However, for the price there really isn’t too much to lose. This device provides a very large 18+- db of gain change; However similar to the other inexpensive bass pedals, it does not provide frequency spectrum options above 4khz, which is vulnerable to higher frequencies leaking in the mix (for a number of reasons), causing slight distortion and hissing. For the price, this is certainly a great device to use, and being so portable and light. 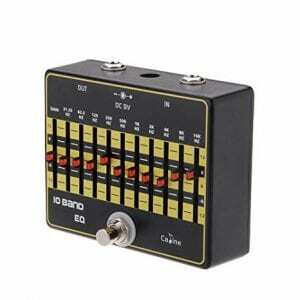 Another inexpensive bass EQ pedal; Compact in size and with a decent gain (db) change, it’s certainly a processor to consider. Our only criticism is that the frequency bands are somewhat sparse, missing out some upper harmonic frequencies (around 6khz)… Ultimately, this pedal may not clean your overall mix like other featured processors would. Video demonstrations of this pedal were not available. 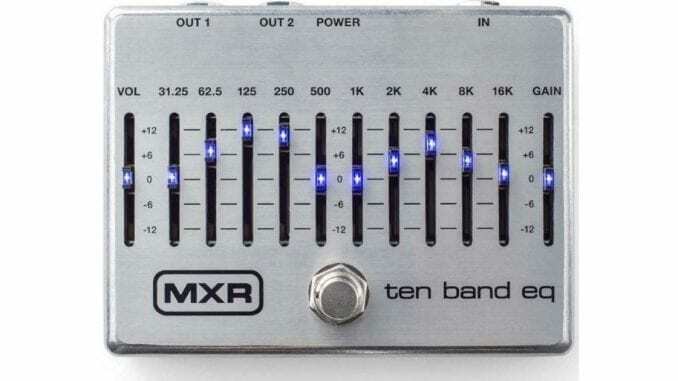 The MXR M109S is in the same series as the MXR M108S, and has the same high quality circuitry, however there are some key differences, with the M109S having a more limited frequency band spectrum, therefore limiting the amount of equalization that can be done on the sub-bass frequencies (<60hz) and enharmonic frequencies. However, the M109S does provide higher db gain and reduction, with +-18db, the highest of any EQ pedal that we’ve featured. Considering this pedal is made by Boss, it’s already going to be good! It’s highly portable, well-built and will be able to take a beating and still work (if you’re taking it on the road). The best ‘all-rounder’, especially for touring, considering its portable size, wide frequency band spectrum and the high level of gain boost/reduction which it can provide. The M108S really is a solid EQ processor for any bassist looking to cover all the frequency spectrums; Not only does it help control sub-bass frequencies below 60hz, but a wide range of enharmonic frequencies well up to 16khz…Now although a bass guitar’s harmonics only reach around 5khz, having the ability to suppress additional high background noise, due to a number of factors, is certainly an added bonus. Not only that, but the 12db +- of gain addition/subtraction means that you really can boost or suppress certain frequencies well in the mix. Overall, a fantastic EQ processor! Taking all factors into account, the best bass EQ pedal for the touring musician really falls between the Boss GEB-7 and the MXR M108S. Either-way, you’ve picked a winner!